Finding the right law firm can be overwhelming. With four areas of practice and 14 lawyers, this Berks County, PA-based law firm wanted to demonstrate its broad capabilities to their diverse audience. 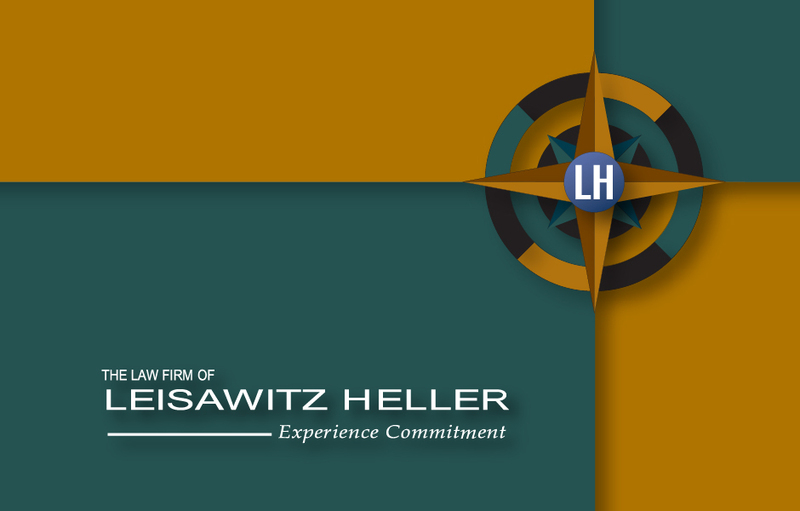 Competitively, Leisawitz Heller has specialists in multiple areas with a lot more to offer than most law firms. However, there were a number of regional, urban, legal practices making territorial inroads. CrossRoads Studios’ Strategic Brand Analysis, interviews with management and clients, a competitive review and research all helped define a “Good Lawyers. Good People.” marketing strategy for Leisawitz Heller’s personal injury group. Projects expanded to include additional attorney groups and the firm. CrossRoads Studios refined the overall Leisawitz Heller visual presentation while adding clarity and consistency. Promotional Folders and Inserts – Collaborating with Leisawitz Heller, CrossRoads Studios developed compelling print and digital materials to help existing and potential clients understand the depth of Leisawitz Heller’s expertise. 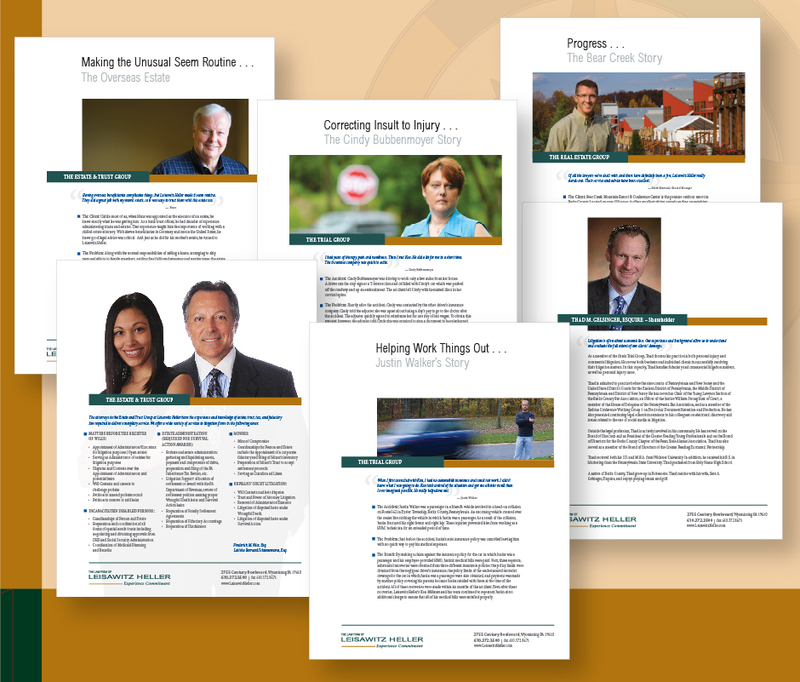 From a dynamic brochure with interesting case studies to attorney biographies, CrossRoads Studios unified the Leisawitz Heller message. The case studies demonstrate a wide range of expertise into simple yet dynamic personalized stories of Leisawitz Heller’s solutions, from issues with elder care… to business capital expansion… sexual abuse… international estate and inheritance planning. 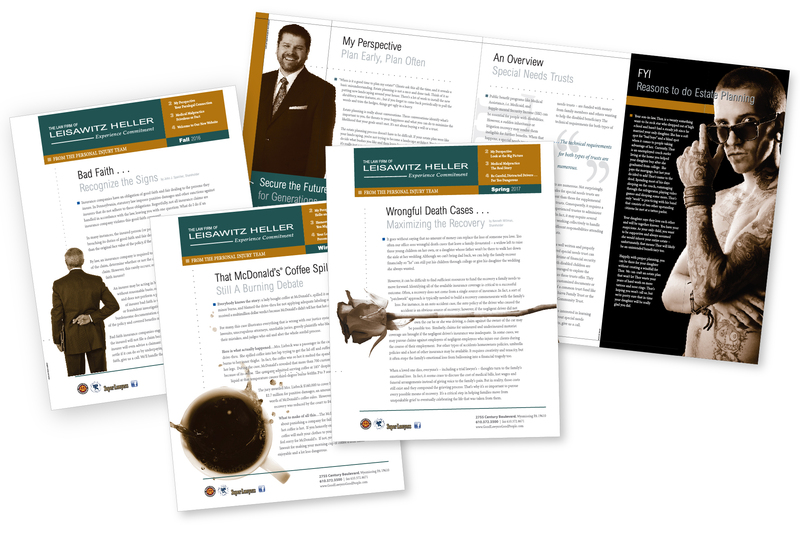 Newsletters – Stylized print and digital newsletters were developed for the personal injury group and expanded to the estate, commercial litigation and business groups. Advertising and Promotions – Ads and promotions were developed for local publications and community events. Videos – CrossRoads Studios collaborated with a video production company and developed video staging, scripts and finished videos. Website and Social Media – A consistent Leisawitz Heller look and feel was developed across all digital materials, including their website and social media programs. Working with web developers, the website was developed with search engine optimization, keywords and analytics. Giving Back – Leisawitz Heller continues to support and be involved with local nonprofits. Attorneys and staff volunteer and support organizations and events such as Relay for Life, Mothers Against Drunk Driving, Easter Seals and the Salvation Army. Leisawitz Heller has worked with CrossRoads Studios on several occasions. We’ve been particularly impressed with their design work. After helping us develop the overall branding strategy for our personal injury team, they helped bring that strategy to life. They developed the look and feel of our website and produced several print ads, brochures, cards and client newsletters for us. Their design work perfectly complements the branding strategy they helped us develop. At each step in the process, they have helped us manage and implement the many details that go into a marketing campaign. They oversaw the photography work we needed, helped us find a trustworthy website developer and helped us refine our community outreach program. But more than just attention to detail and managing the production process — they’ve injected a level of creativity into our marketing efforts we could not have produced on our own. One In a Series of Fun Videos (Annual). With Leisawitz Heller’s support of nonprofits and focused marketing materials, advertising, web and videos, their consistent message and presentation are helping to build a stronger presence in the community. Is your marketing reaching your target audiences? Let’s discuss. CLIENT NOTES: Leisawitz Heller is located in Berks County, PA serving the surrounding areas and the Greater Philadelphia region. Its areas of practice include the Business Group, Estate and Trust Group, Personal Injury Group and the Commercial Litigation Group.